Discuss variables and statistics related to aging. Define functional age and chronological age and discuss parameters for categorizing older adults. Identify 5 benefits of the aquatic environment for older adult exercise. Identify and discuss 5 major categories of physiological changes related to aging. 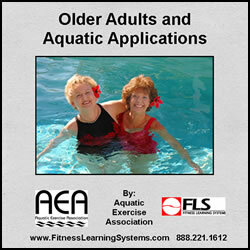 Discuss marketing strategies for older adult aquatic exercise. Explain how aquatic fitness programs improve psychological and social quality for older adults. Identify the 4 components of an aquatic class for older adults. Describe special considerations for programming and limitations for older adults participating in aquatic exercise. Discuss skills desirable for an older adult aquatic exercise instructor including 3 ways to develop rapport and 4 skills to use during and after class. Review 3 sample aquatic workouts for older adults and explain safe and effective exercises for warm up, cardiorespiratory endurance and flexibility.